Hi, first-year students! Welcome to Villanova! 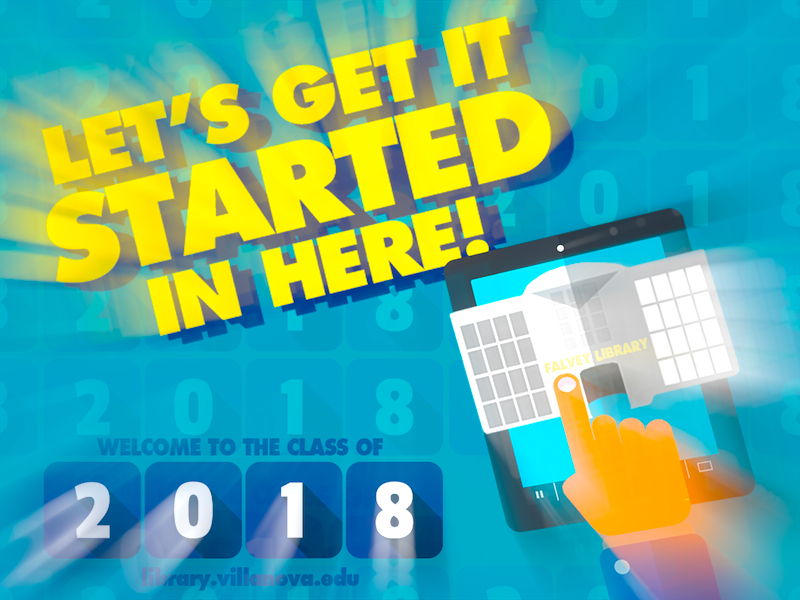 Orientation is now over and we know your OC’s (Orientation Counselors) have done most of the “heavy lifting” by providing the Class of 2018 with a wealth of information and activities designed to acclimate you to life at Villanova. Your excellent professors will continue the job from here, including introducing you to the vast resources available at Falvey Memorial Library. Until then, we have a few things you may want to keep in mind for the first week or two of the semester – a critically important time that can impact your grades in the months to come. Don’t skip class, bring a pen and take scrupulous notes, even on the first day. While the information the professor imparts the first day might not be the Most Important Thing you’ll ever learn from him or her, you may learn equally germane things, such as what books you need, any changes to the schedule, project due dates or late paper and attendance policies. Take note – this is the day you may learn what can get under their skin! Check your email frequently, too – sometimes there are ‘pre’ first day assignments. You’ll want to be prepared if the class suddenly jumps into a discussion of a reading the professor sent ahead of time. It’s not fun sitting there, conjuring all your psychic energy just to not be called on! #beenthere. Scrutinize the syllabus. Ask questions now. Find out your professor’s office hours and—more importantly—location. Take his or her advice on how best to approach what you’re being asked to do – sometimes, they’ll give you the “answers” ahead of time! While it may be boring to sit through a long read-through of a three or four page syllabus, it’s also the time the prof imparts a lot of offhand, administrative info that if you don’t catch now, he or she might never repeat. Then you’ll have to get it down the road, during crunch time, and second or third hand from a classmate – who might not be reliable. This is not a good combo. (Remind me to tell you about the time I missed my astronomy final exam due to secondhand information.) Another good tip: photocopy each of your syllabi and pin them to your bulletin board – you’ll be glad you did! Arrive ten minutes early – and get a good seat down front. Sitting in the front helps you focus, helps you resist playing with your phone and ensures that you’ll be one of the students the prof remembers – an awesome thing when she’s putting together your participation grades. And arriving a bit early each week allows you to get the seat where you’re most comfortable, and with students you may want to study with. Relatedly, take a good look at your schedule and plot it out with a campus map. Give yourself enough time to make those cross-campus treks if need be. That walk from Bartley to St. Mary’s can take a good fifteen minutes – 30 if you stop at Falvey’s Holy Grounds for a latte. Better yet, pack a water bottle and a Quest bar in your backpack – hunger and thirst does nothing for your concentration levels. Inner mom speaking here. Scope out the good study spots. The Library has plenty. You may recall from your campus tour that the library’s third and fourth floors get the best press for getting progressively quieter as you go up. There are also group study rooms up on those floors with nice, big chalkboards and lots of outlets. But you can find many other perfect places, too. The 24/7 Holy Grounds lounge, for example. It may be noisy during the day, but there’s plenty of java and goodies, and no one will ever. make. you. leave. But other, less obvious places abound. The section of the second floor Learning Commons near the back staircase is funky, well-lit and very quiet with quick access to the Writing, Math and Learning Support Centers. These centers themselves are beautifully furnished with cushy nooks and are great resources for when you need extra help in those areas. Also, don’t forget to venture into “Old” Falvey Hall, which has two 24/7 Wildcard accessible outside entrances on the path adjacent to Mendel Field. The lounge directly outside the director’s office is extremely quiet and quite handsome, with bright inviting furniture and a wall of giant whiteboards for your use. Another best kept secret is the cozy lineup of old, vintage leather couches on the bottom floor of Falvey Hall – often used as much for sleeping as for study. There are seldomly used large restrooms down there, too. And of course, there’s the piece de resistance – the Falvey Hall Reading Room. Vast, vaulted ceilings and flooded with natural light, you’ll love sitting in this quiet space with its large, spacious tables. The only sound you’ll hear will be the pusht pusht of the da Cortona painting conservators’ rags and brushes. Claim your space now before it gets really popular! By the way – did I mention that this gorgeous space is also open 24/7? So clutch! Get to know your subject librarian early in the semester! They can help you with any assignment – not just the major ones at the end. Did you know that each major has its own subject librarian that specializes in showing you how to find and mine the best resources that the world has to offer in your subject area? They have also prepared amazing subject guides which you will find indispensable. And they can introduce you to awesome apps, electronic style guides, organizers, and citation managers that can make juggling five or six classes a heckuva lot easier! Subject librarians are here exclusively to help you – introduce yourself today! You can reach them via email, live chat or of course, in-person during regular library hours. library.villanova.edu – your new favorite website. Annd, (you’re already doing this one really well!) continue to follow the Library News blog. You’re going to love the tips we’ll share week after week about the latest and greatest books, databases, e-reference works, apps and more available to you. It’s also the best place to check for updates on hours, library events and policies. And naturally, library.vilanova.edu is your best access point for VUFind – an amazingly robust search and discovery tool – it’s not just a catalogue! It has amazing technologically advanced and customizable features that you can tailor to your needs. VUFind was developed right here at Falvey, and it’s a gold standard in academia, used all over the world! Explore its capabilities and make it your own today! So, the fun is just beginning, first-year students! Those jitters will go away soon, we promise. Don’t forget to breathe! And, most importantly, don’t forget that you can always come by the Library for advice, help or a smile whenever you need it! Stop by the front desk, log onto live chat (look for the green light on the bottom right of our homepage,) or shoot us an email with your comments, questions, suggestions, etc! Even easier, look for and engage with us on social media – we have active accounts on Facebook, Twitter, Instagram, Pinterest, YouTube, Tumblr and more! (Or see them all in one place, at Rebelmouse!) Alternatively, hashtag #falvey and we’ll find you! We’ll be looking forward to your likes, follows, comments, and RTs! Until then, here’s a small welcoming gift – dress up your laptop for the fall semester by downloading your Let’s Get it Started in here wallpaper! We’re excited for a great new year – hope you are too! To change computer wallpaper, open the link and drag the graphic to your desktop, then open your monitor settings to switch wallpapers.